While the other vegetables, rugged rough-and-tumble types that they are, enjoy the great outdoors, the lettuces are homebodies and prefer to be inside the house. Lots of direct sun and the accompanying heat are fine for the hardier plants—summer squash and eggplant among them—but the relative cool and steady light (thanks to fluorescent fixtures and automatic timers) of the basement suit the more tender romaine and red leaf to a T.
And a trickle of water for 30 minutes every other day may be enough for ascetics such as the tomatoes but lettuces, hedonistically, would rather bask in constant humidity and completely moist soil, thank you very much. I find it hard to believe that the romaine and red leaf lettuces we seeded back in March—and early March, at that—are still producing new leaves as they sit quietly in their planter boxes. They’re not alone down there: one Yellow Brandywine and two Yellow Belle pepper seedlings share space with them. 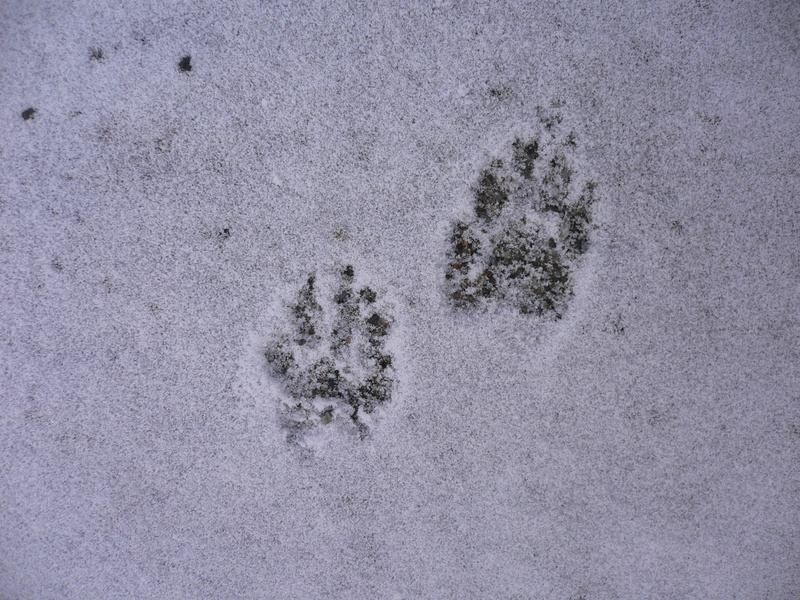 These companions, though, are not yet producing. Although still healthy, the lettuces are becoming stemmier (if that is a word) in preparation for bolting; one of the plants is about a foot high. 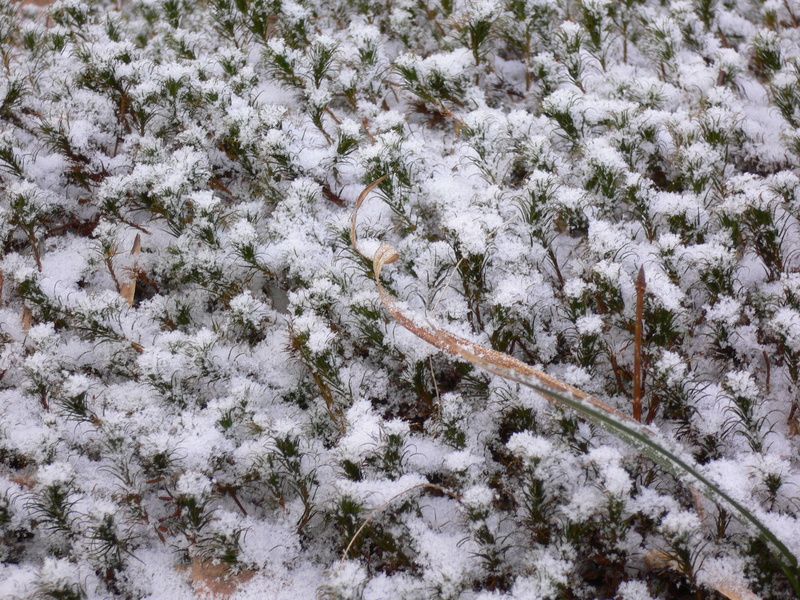 At the same time, the leaves are thinning and they do not hold moisture as well. Their texture is leathery and their flavor more bitter. Five months is old for lettuce. So, enough cutting and coming back. We’ll clear-cut what remains and have a big salad for dinner. That will be the end of the spring lettuce. It won’t, however, be the end of the lettuce. 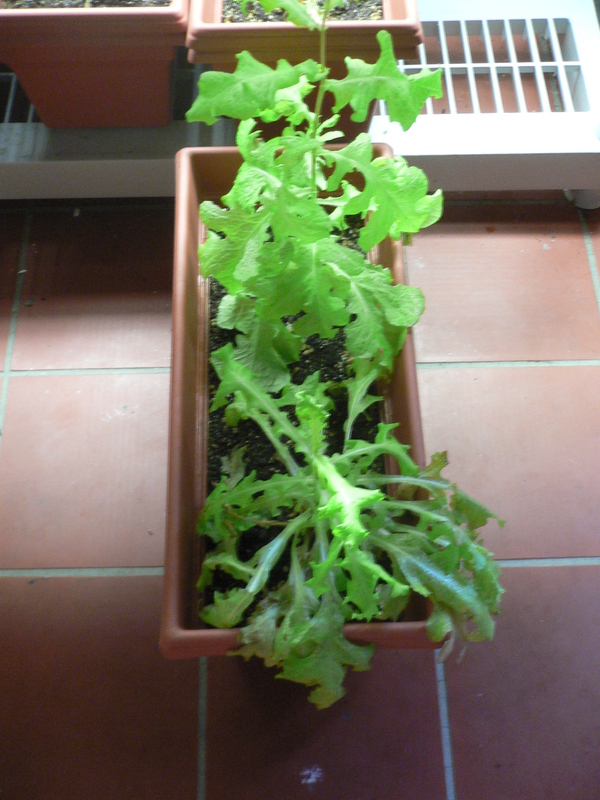 Also growing in the basement is a lone head of romaine, the only one to sprout from our summer sowing in June. If it performs like its siblings before it, we’ll be eating fresh lettuce in October. 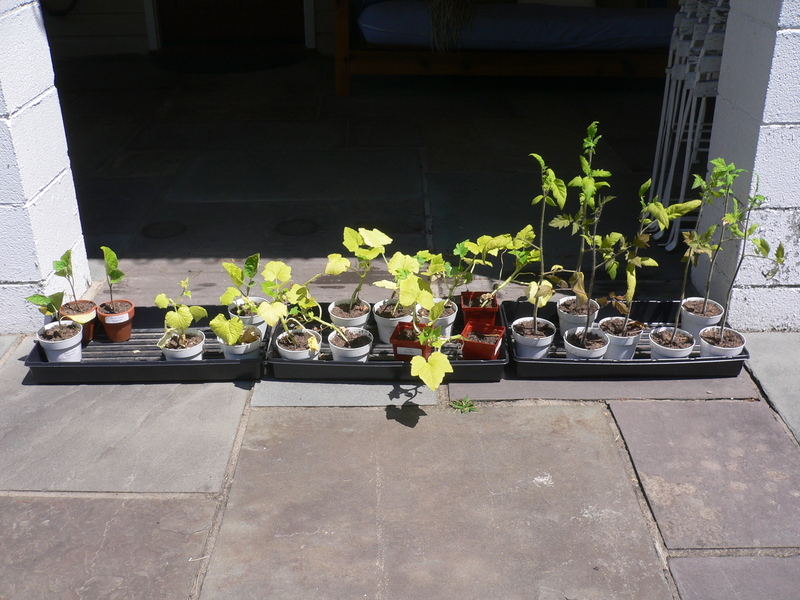 At last, time to set out the vegetable seedlings (and, at last, time to blog about it). We’re two weeks later than usual (we’ve set out on Memorial Day each of the last three years), mainly due to lingering cool weather. And it’s more than a little ironic, considering that we sowed seeds for some of the vegetables much earlier than usual. 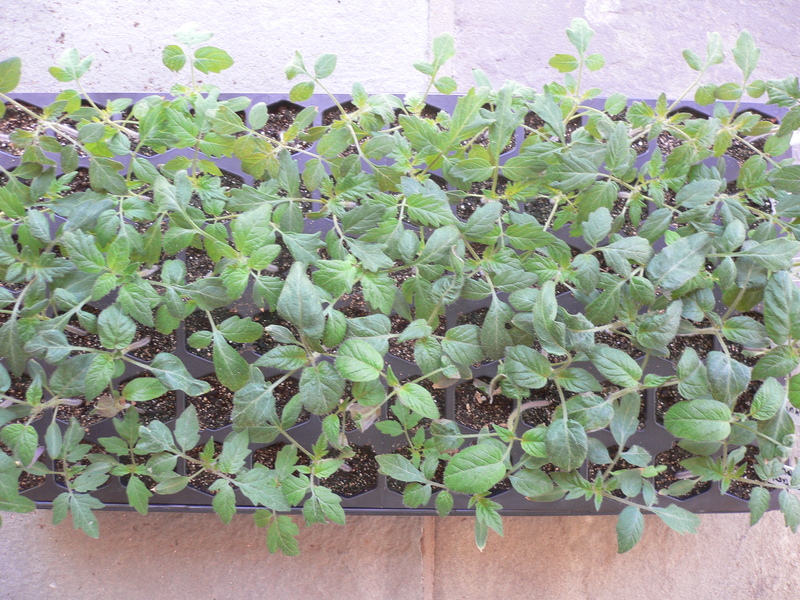 Germinated indoors and then coddled during their early weeks with 16 hours of light per day and continuous heat, the tomatoes, eggplant, bell peppers, summer squash and cucumbers should have been raring to get outdoors a long time ago. Yet somehow, they knew. They knew that indoors was much nicer, especially at night. I can’t say that I blame them. I wasn’t ready to spend much time outdoors until just recently. 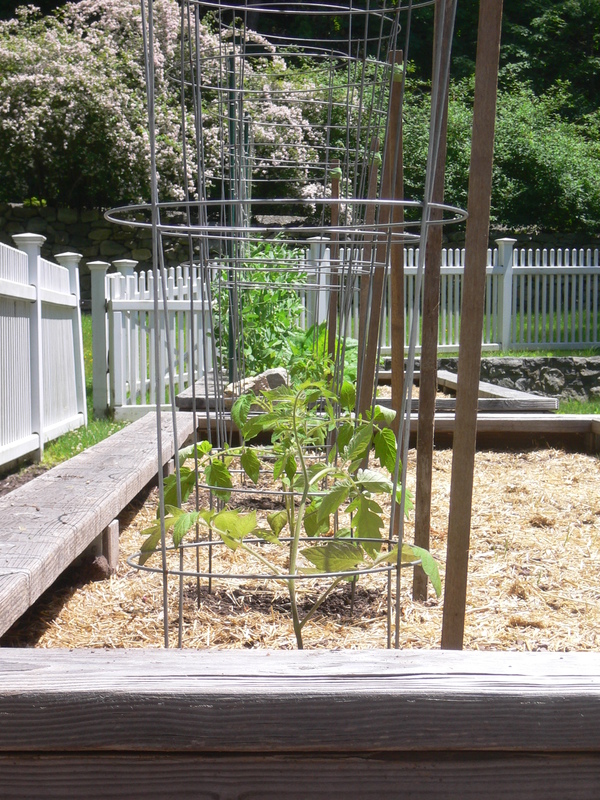 To prepare for the seedlings, I first weeded the beds (see June 8, 2014) and then installed cages for the tomatoes. As in prior years, we’ll have a row of six cages along the north side of the planter; this year, the west planter is up in the rotation. In a departure from past seasons, however, we will plant only one seedling per cage. To increase our tomato yield, we will also plant another six seedlings in the mounds at ground level, where the squashes mostly thrived last year. In May, we prepped the old mounds by adding fresh soil and mulch (see May 11, 2014). Today, we installed three cages. This exhausted the supply on hand and we will have to make a trip to the garden center for another three (we have some time before the tomatoes will actually need them). We have four varieties of tomato—Sungold, Black Cherry, Yellow Brandywine and Country Taste Beefsteak—but unequal numbers of each. 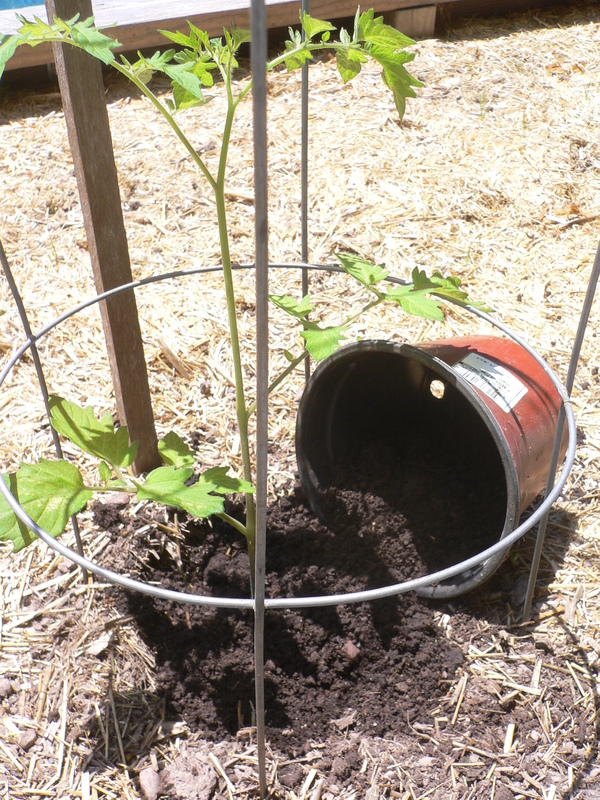 Because the west planter should be the safest (we’ve spotted evidence of moles or gophers this year; see June 1, 2014), we planted two each there of our favorites, the Sungold and Country Taste. One Yellow Brandywine and one Black Cherry filled out the row. 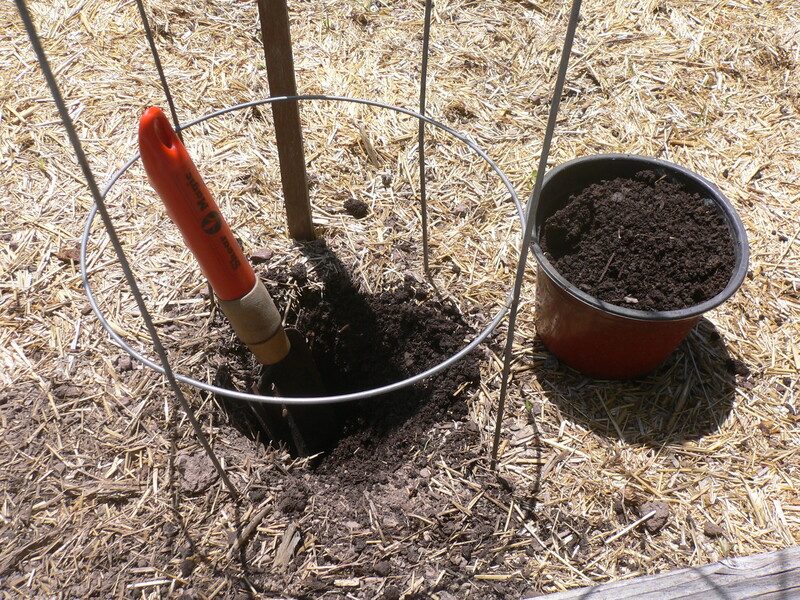 That left one Sungold, two Yellow Brandywine and three Black Cherry plants in the ground. It will be interesting to see which vines do better, those at ground level or those elevated in the planter. My money is on the planter. 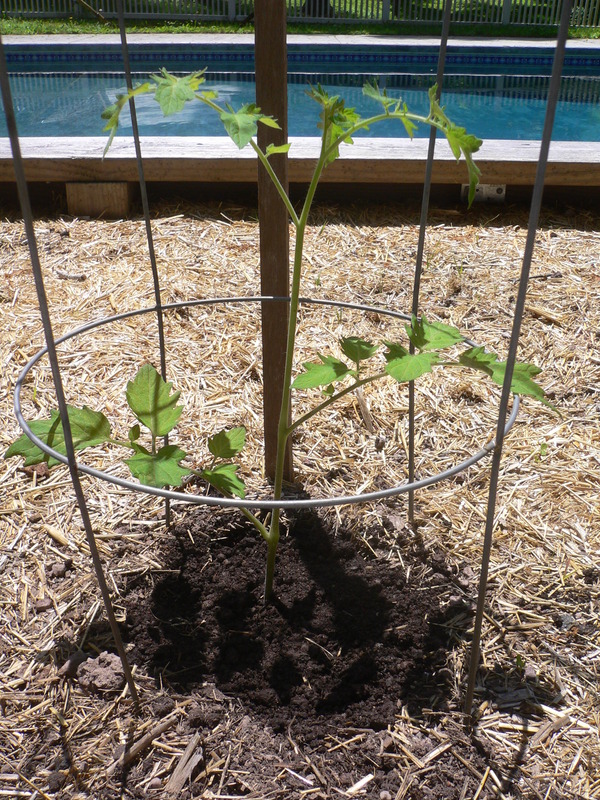 After getting the tomato seedlings transplanted—buried up to their first branches to promote root growth—we moved on to the summer squashes. We set out two Supersett Yellow Crookneck, one Cavili zucchini (the only seedling that germinated) and three pattypans, one of each color (at least, I presume). I noted the location of the plant from each seed color so that we can confirm the color mapping (see May 26, 2014). When we finished (at about two in the afternoon), the day had turned quite warm and it was time for a swim. 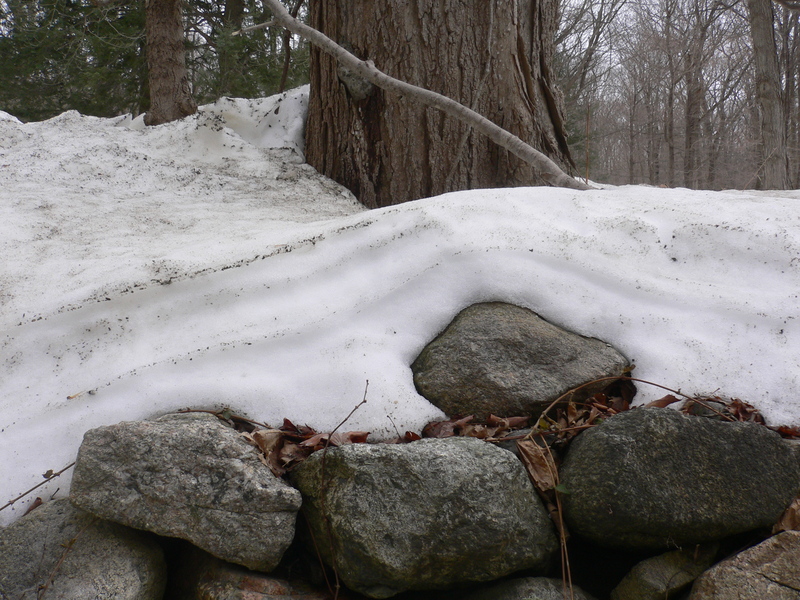 A couple of weeks ago, I read a gardening article that might be the first one I have ever seen that makes a case for not starting plants from seed (see “Roots and Shoots: How Homegrown Is Necessary?” which appeared in the February 14, 2014 issue of Philipstown.info The Paper). Pamela Doan’s column does include simple and useful instructions for starting a garden indoors in winter (with an emphasis on tomatoes) but starts off with her reasons why she doesn’t do it. It’s nice to see someone bucking the conventional wisdom, even if I don’t necessarily agree with it. I’m a complete believer in starting from seed when possible but I recognize that doing so can seem like a lot of effort. 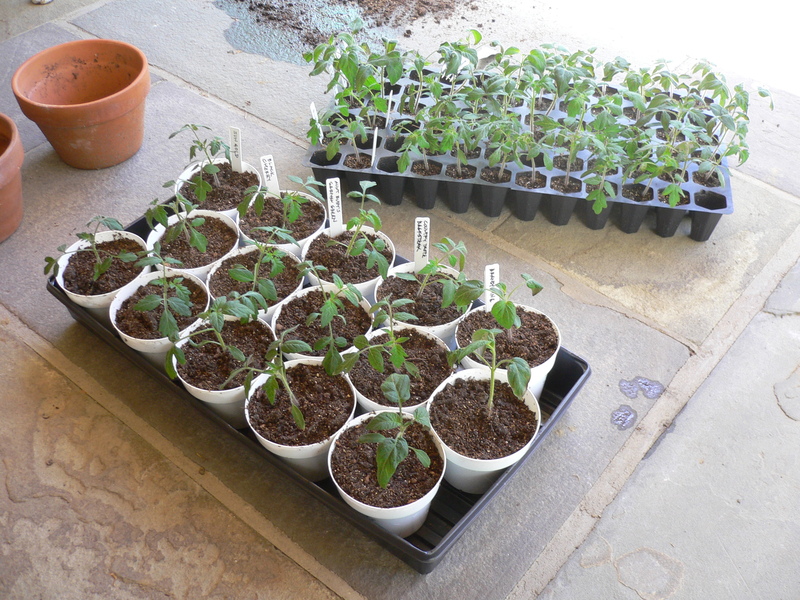 If the choice were between buying seedlings or doing nothing, I would buy the seedlings (as I did in 2011 and 2012). Like most gardening projects, however, sowing seeds requires intermittent bouts of close attention—often accompanied by intensive activity—but little effort otherwise. Once the seed trays have been set up and are safely tucked into a warm and well-lit location, they take care of themselves for the most part. Only a modest investment of time is needed. Potting up requires another infusion of time but the task is not much different from setting out, something that must be done whether the seedlings are home-grown or store-bought. Similarly, the financial investment needn’t break the bank. 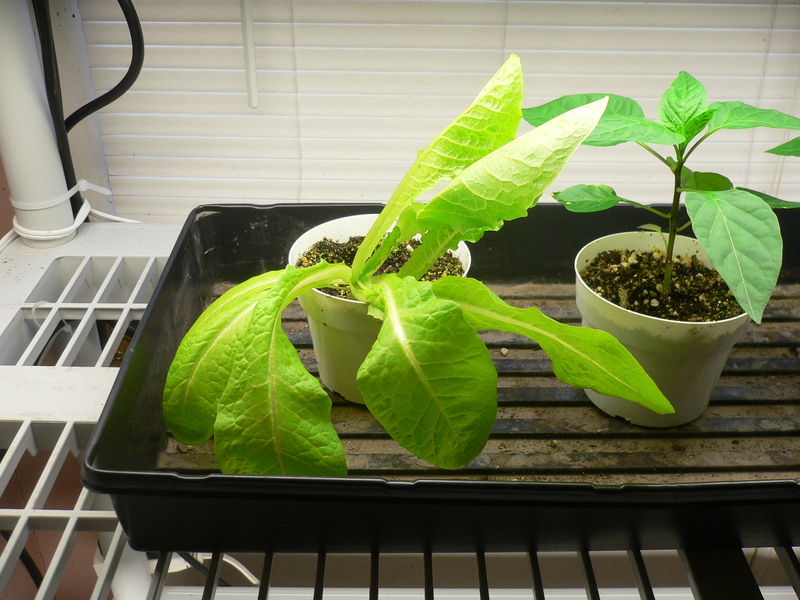 Unquestionably, one can spend a lot of money on seed starting apparatuses, depending on size, features and aesthetic appeal. And the cost of specially formulated grow lights and heating coils specifically designed for seed trays is ridiculously high (a case, I think, of commercial opportunism). Expensive whistles and bells will not necessarily be of benefit to so basic an operation. Fortunately for one’s pocketbook, for example, plain fluorescent lights and utilitarian heating pads work just as well as their high-end counterparts. 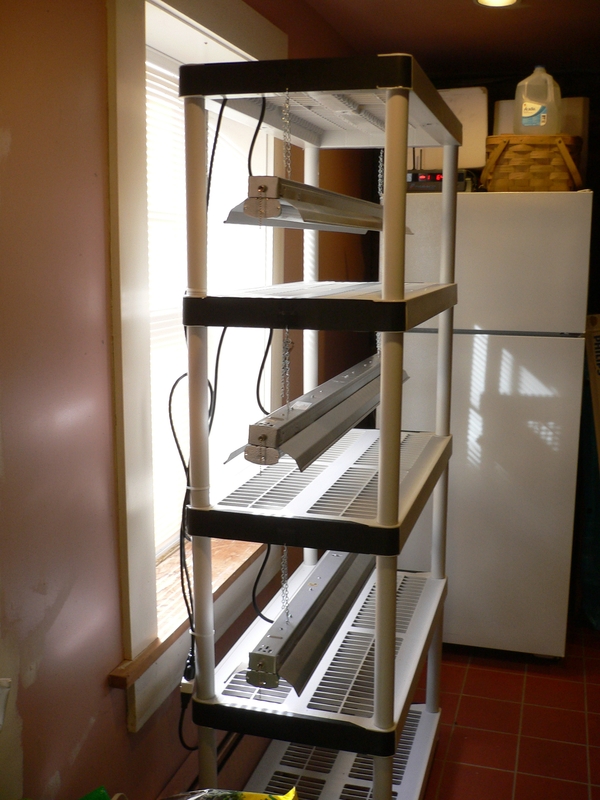 In fact, as we found out last year (see February 18, 2013), a spacious and efficient seed starting apparatus can be put together for very little money. 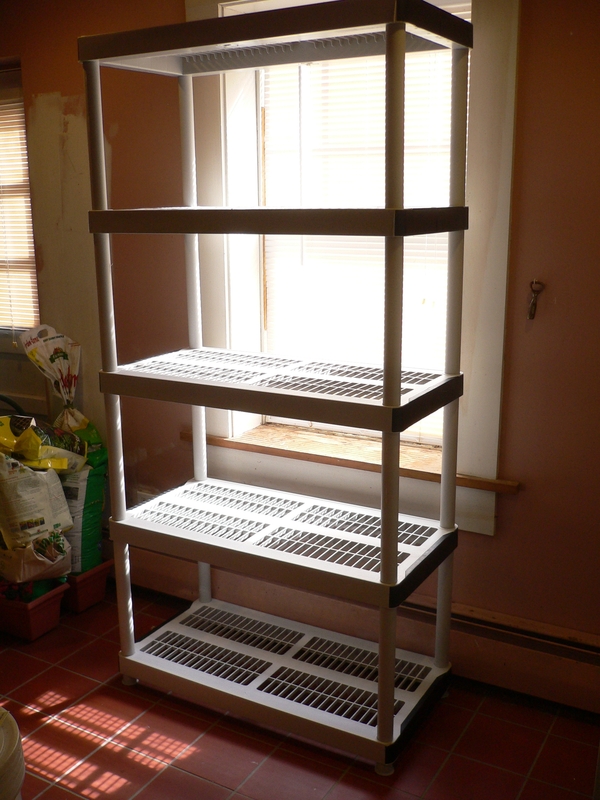 Our modified shelving unit (including lights, pads, and seed trays) cost less than $200 and can accommodate 432 seedlings on three shelves (with two shelves left over). A smaller apparatus would be proportionally less money. The unit should last essentially forever; there will be no new expenses year to year so the effective cost, amortized over its expected life, is even less. 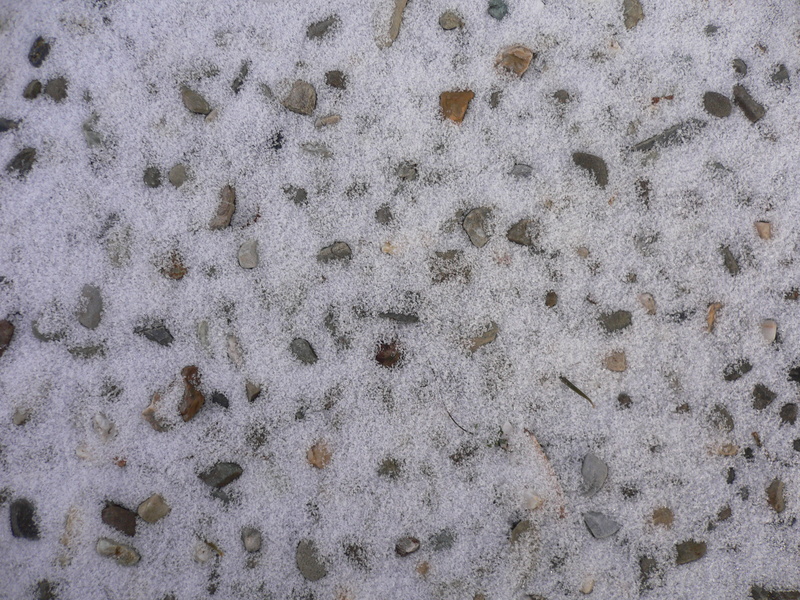 Further, it can be used for storage off season (a mixed blessing; see January 8, 2014). Existing shelves similarly modified would be more economical and a sunny windowsill, for those lucky enough to have one, is even cheaper. The most eye-opening of Ms. Doan’s arguments against starting from seed is her primary contention that most seed companies put too many seeds in each packet. To her, this means planting more of any given vegetable than perhaps she would like. 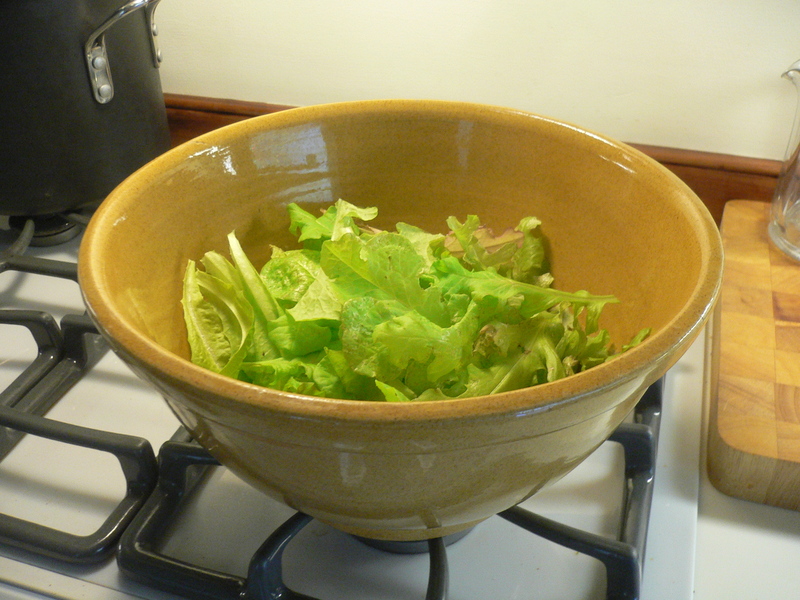 The result, given overall constraints of time and space, is a lesser variety of vegetables. Either that or wasted seeds. I’ll admit that last year we started more seeds than we needed (72 basil plants; really?). But that was due to inexperience and pessimism. With no idea of what rate of germination to expect and a firm commitment to planting only our own seedlings, we erred on the conservative side. We didn’t let that impact our decisions about what to grow, however. Instead, we gave away as many seedlings as we could foist off on people and, with some regrets, cast what we couldn’t use onto the refuse pile (see, for example, May 4, 2013, part 2). The startling part of the surfeit-of-seeds concept, though, is the implication that all of the seeds in a packet must be planted at once. This notion never occurred to me. I am frugal (some would say cheap) about many things (but by no means all) and always intended to save the seeds I did not plant last spring to use again this year. The average seed life is printed on each packet and most are theoretically good for two years or more. I say “theoretically” because, of course, seed life depends on how the seeds are stored between planting seasons. We kept our seeds safely inside a small box in the basement. There, they were protected from light and excessive heat and moisture. 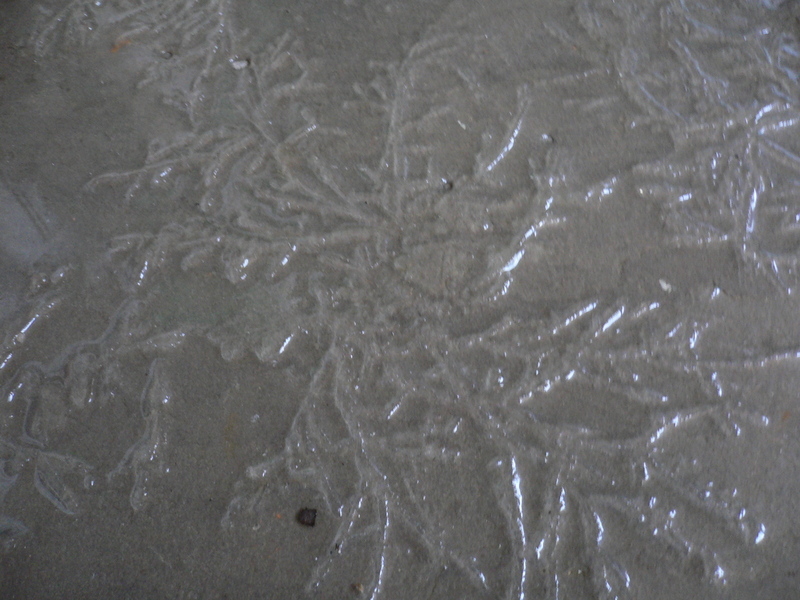 It can get warm and humid here in July and August—and last year was particularly torrid—but the basement is partially underground which mitigates the extreme weather conditions. The small volume of the box should have further minimized the effects of summer. (Some would suggest storing seeds in the freezer, as we did with seeds from two years ago; unfortunately, they are too easily forgotten that way, by which I mean that I forgot about them.) Even after a year, the seeds should still be viable. So now we’re in the process of finding out whether they actually are. Our plan this year is to sow fewer seeds of each type of vegetable and, possibly, to plant additional varieties (this would require buying more seeds or, later in the season, seedlings). 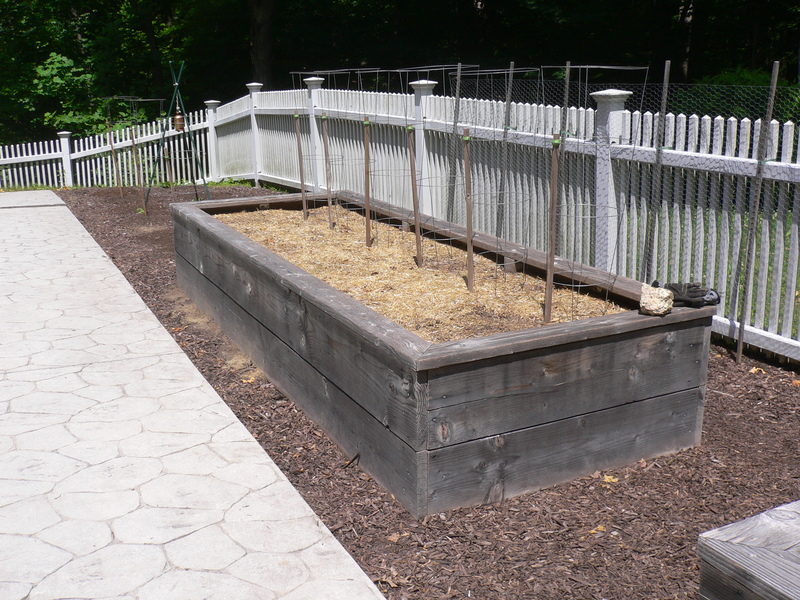 So far, we have only planted herbs (six seeds of six varieties) and lettuce (six seeds of two varieties). 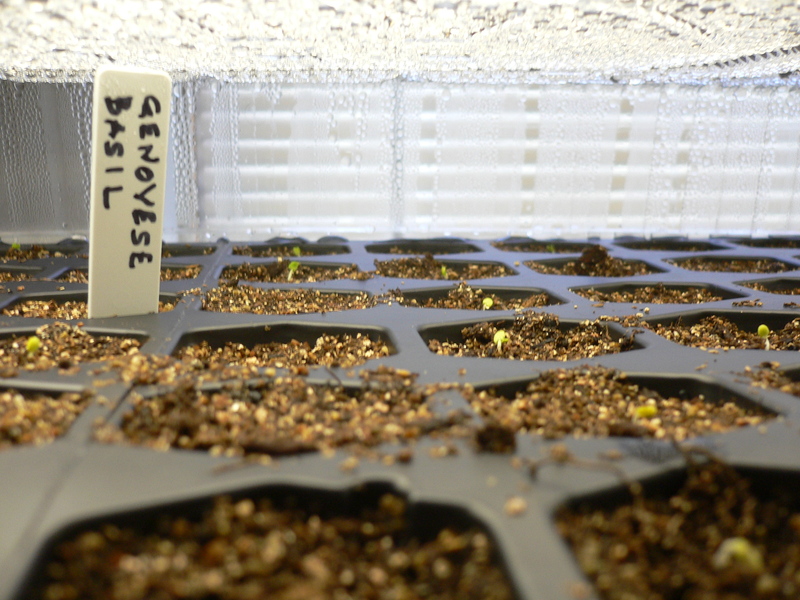 The lettuces are sprouting at about a 50 percent success rate while only two herb varieties (basil and rosemary) have germinated. Herbs are notoriously slow to get started but I should note that all of the herbs except the basil have an average seed life of only one year. 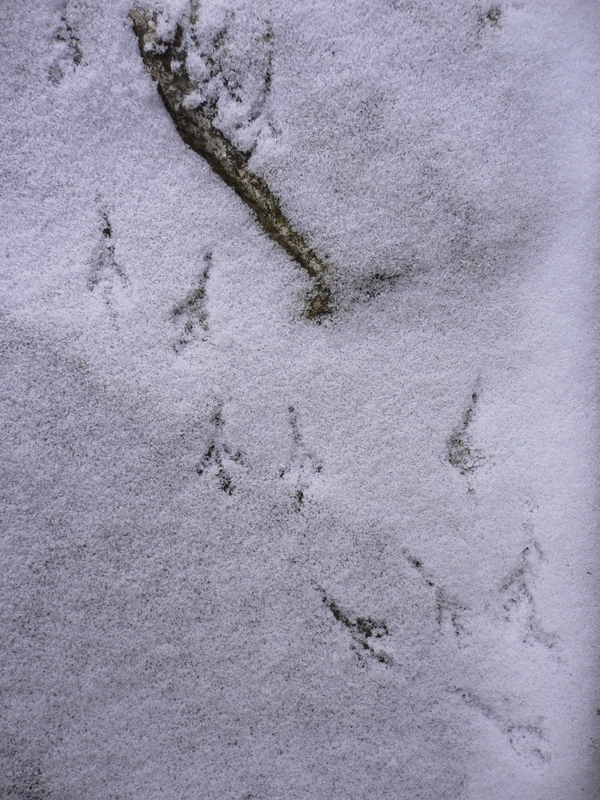 I may be pushing my luck—and the limits of my faith (see February 19, 2014). Contrary to the Roots and Shoots article, there is more than bragging rights to be gained from growing plants from seed. 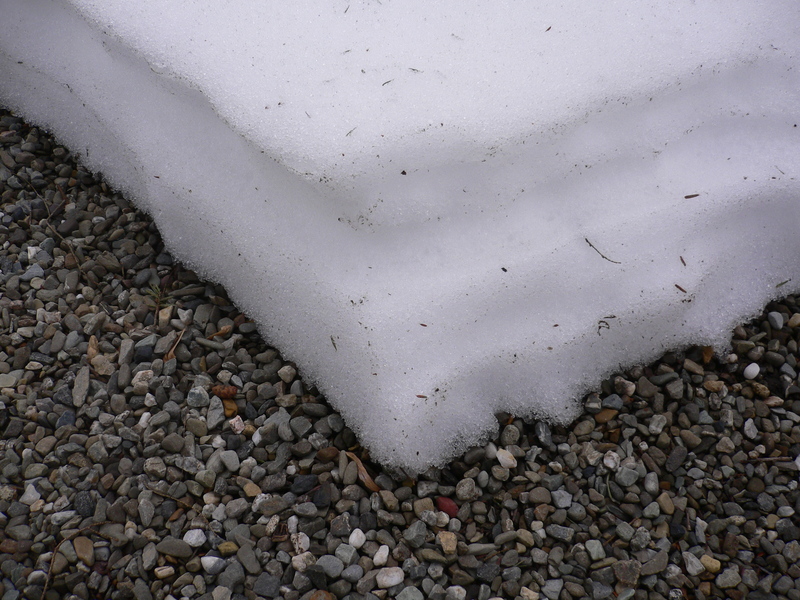 It is a relatively easy and inexpensive way to get the garden started and to jump back into the gardening spirit, even in the midst of winter. And for a control freak like me, it is the only way to grow exactly what I want and to know everything about my plants. The bragging—and blogging—rights are a nice bonus. Wrapping up my assessment of last year’s plantings in preparation for this year’s (see February 6, 2014 for the previous installment), the eggplant and bell peppers are two other vegetables (three, if you count the different colors of pepper separately) which were delicious and did well in our garden but which could use more space. I had read that bell peppers like to be close to each other—to “hold hands,” so to speak—and set them out accordingly. I treated the eggplant, the peppers’ near relatives in the deadly nightshade family, similarly. However, I think that my efficiency in filling the available space actually worked against me. I planted the eggplant and bell peppers in a staggered row which allowed me to fit eight plants into only about a sixth of the planter. The plants were certainly cozy. It was great until the plants grew up and out, at which point the back row was almost completely shaded by the front row. In a Catch-22 situation, the plants in the back were never able to get the sun they needed to grow above the plants in front. We’ll grow them again this year but keep them in a single row. There will be fewer plants and they will take up more space but they should fill out more and produce a greater number of fruit (last year, each plant only yielded two or three). Also, I have read that eggplant is a heavy feeder and I assume that the bell peppers are, too. Therefore, I will fertilize them more often. What’s left? Lettuce, for one thing. The seeds we planted outdoors in early spring thrived. We were lucky with the weather—not too much heat or rain—and the first seedlings quickly grew into diminutive heads of red leaf and romaine. Contrary to expectation, they were hardy enough to transplant and remained productive well into the summer. They did not turn bitter until the very end of their season. We were not as lucky, however, with the second and third sowings. Most of the seeds germinated but by the time the seedlings pushed through the soil surface, the weather was either very hot or very wet or, on some days, both. 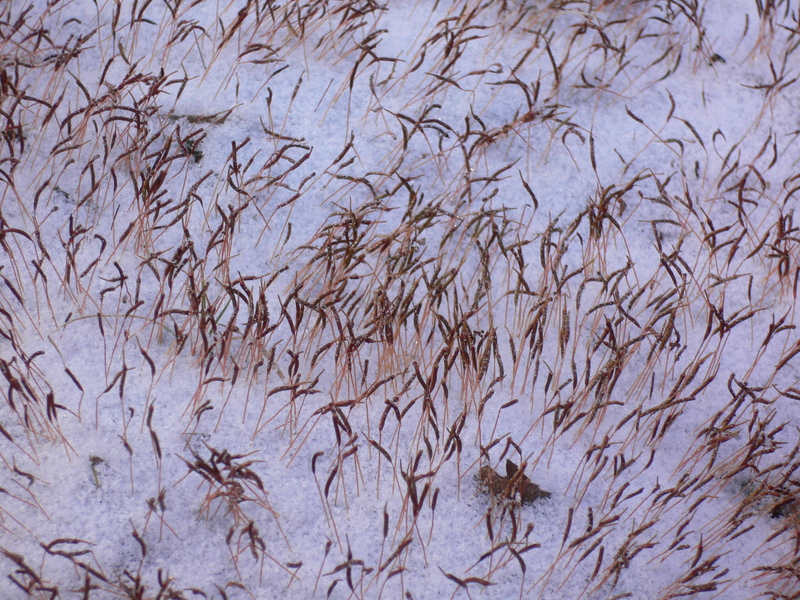 The extremes were more than the tender seedlings could manage and they simply disintegrated. It seems that there is a critical period during which the seedlings are quite sensitive and after which they are much sturdier. Therefore, this year we will start the lettuce indoors. With the enclosed seed trays, heating pads and fluorescent lights, we can better control their environment during the sensitive stage. After they develop into heads, we will transplant them into larger pots and move them around, inside or out, based on the weather. That only leaves the sugar snap peas and the string beans. All of these performed phenomenally well, especially the peas which came pretty close to my ideal vision of the vegetable. (If I am a bit hyperbolic, it is because they are some of my favorites.) We will plant them again this year and see whether we can make them even more successful. Well, we did our best to find homes for all of the seedlings—plants we started from seed, raised indoors under fluorescent lights, nurturing them with gentle watering and periodic doses of fertilizer until they grew large and strong enough to be set outside to take their chances with Mother Nature and other gardeners—and we were reasonably successful. Of the eight or so people we reached out to, four accepted our offer. And while one took only a few seedlings (her gardening space is small), three left here with one or two of each. We started with six trays of seedlings which potted-up to six trays full of fledgling vegetable plants; today, only about 20 remained. 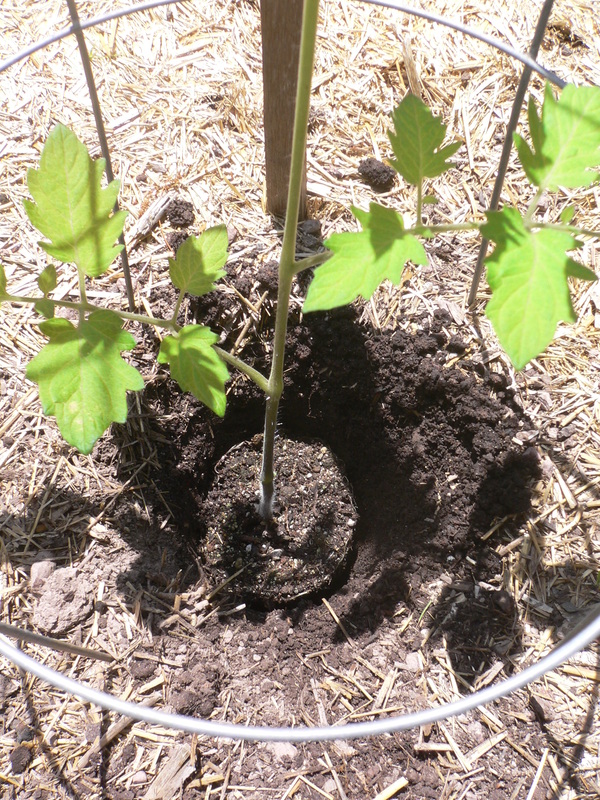 It is late in the planting season and the seedlings have almost used up the nutrients that remain in their small pots of soil; their leaves have all turned yellow. We can’t think of anyone else to offer them to so…we let them go. We said some words of thanks and tossed them onto the refuse pile. They were a good bunch of plants and I’m sure their energy will return to our garden, somehow, in a future year. The two reluctant tomato varieties—Aunt Ruby’s German Green and Black Cherry—pushed out of the soil today. We are six for six on varieties with only a few seeds that did not germinate. I’m excited to see how the seedlings fare. 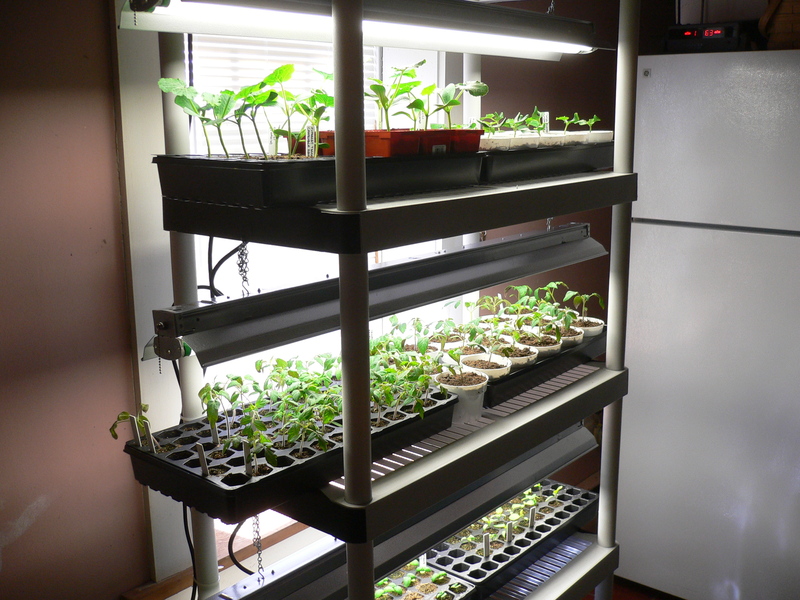 With the tomatoes and basil mostly sprouted, I connected the fluorescent lights to the timer to help the seedlings grow. The lights will shine all day and into the night, providing both warmth and illumination. I am keeping the heating pad under the eggplant and bell peppers and will turn it on and off manually until they decide to sprout. Now I know how the mother hen feels when sitting on her eggs. 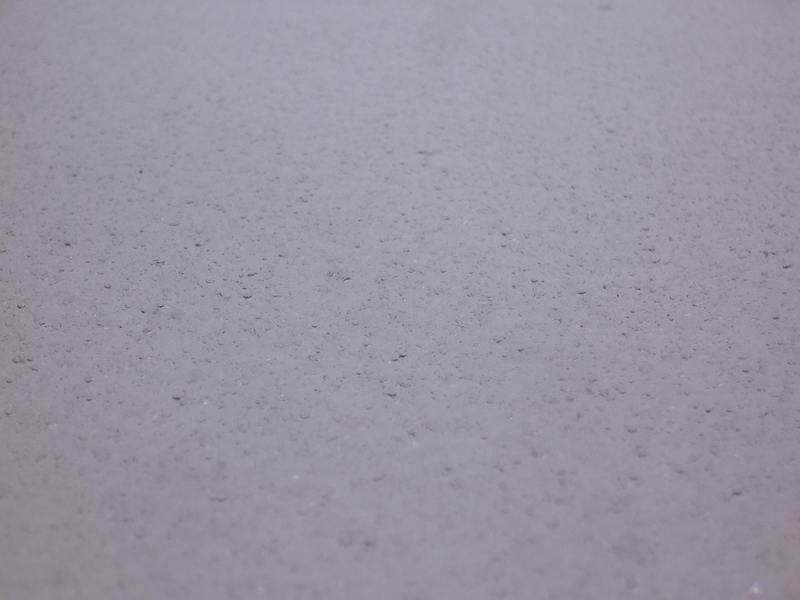 Theoretically, we could be starting our outdoor planting today but even if the weather were sufficiently hospitable to accommodate outdoor activity—and it isn’t—it wouldn’t be anywhere near warm enough to initiate germination. So instead, we turned our attention indoors and put together our seed-starting apparatus. The first step was choosing a location for it. 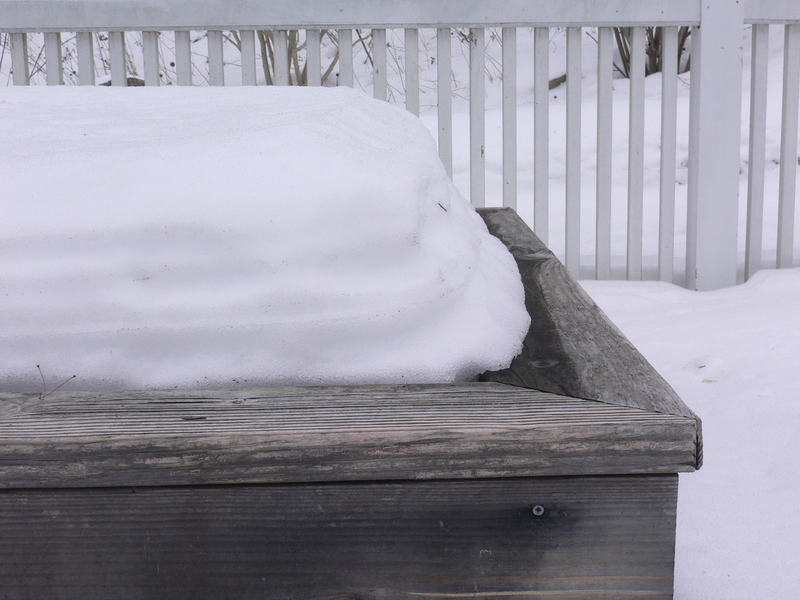 We had originally thought to put it near the oil burner to take advantage of excess heat (I like to think of it as a variant form of cogeneration). Based on the arrangement of our basement, however, there is no excess space there. Also, there is no outlet nearby to plug in the lighting fixtures. On the other hand, the spot in our storage room (or, as we lovingly call it, the Mouse Room) where we had temporarily stacked the components is directly in front of a south-facing window. 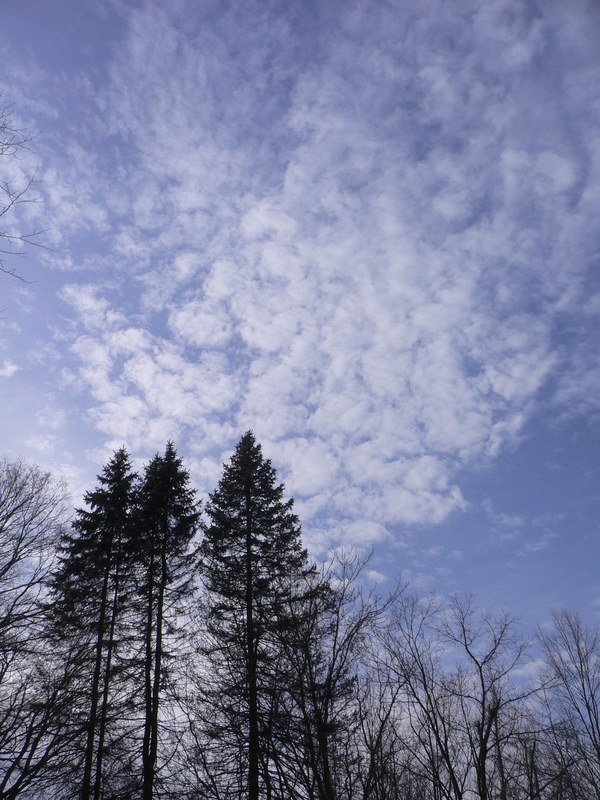 There is plenty of sun there and even on a cold day like today, it feels relatively warm. 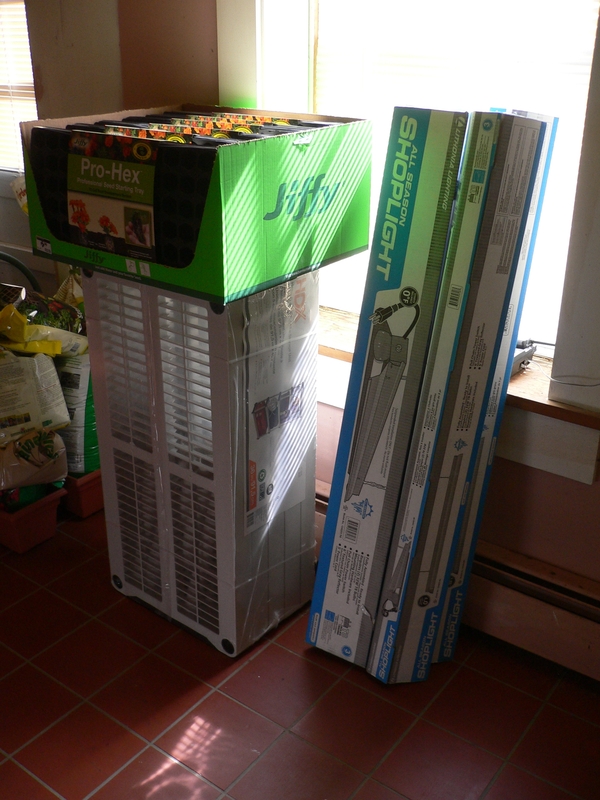 As luck would have it, the extra height of the shelving unit we purchased (see February 18, 2013) elevates the three seed-growing levels to window height. And what’s more, there is an electrical outlet under the window. Without having to look too hard—really, without having to look at all—we found our spot. We next assembled the shelving unit, the design of which is simple and ingenious. The number of different parts has been minimized by making all of the shelves and post sections identical. Therefore, there is less risk of a missing part and it is much easier to supply it if necessary. The only other parts are the post bases and caps (and, strictly speaking, the latter are not required) which connect to the unit in the same way the posts and shelves connect to each other (and without fasteners). The unit went together quickly and easily. We then drilled holes in the sides of each shelf to connect the S-hooks from which the light fixtures will hang. 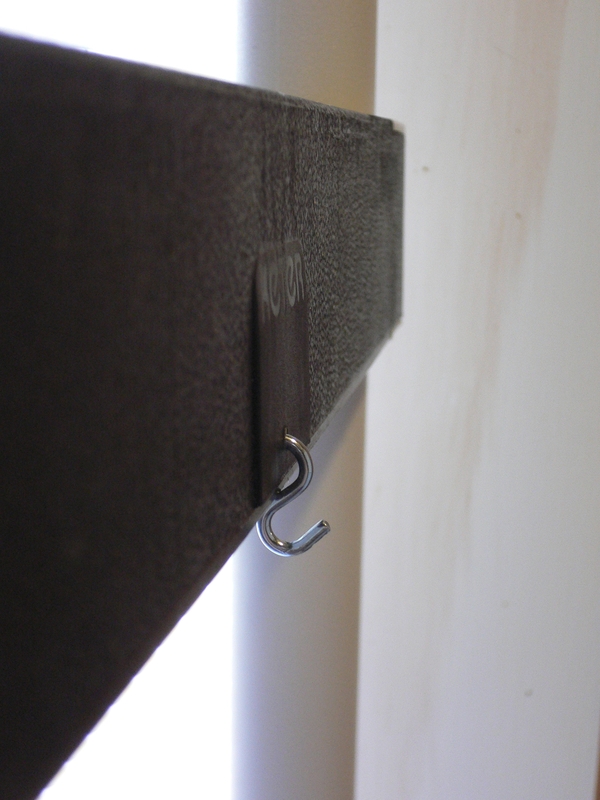 The shelves, constructed of heavy-duty plastic, have a double-wall design so rather than punch all the way through, we drilled only the outer face. This meant making the S-hook connection blind (as a steel erector would say). To get them into the holes, we had to slightly open one end of each hook. Even so, they fit snugly and securely. In the online and package illustrations, the chains for the light fixtures appear to connect about six inches inboard of their ends. This would have been perfect so I was not surprised to find that in reality, the connection holes for the chains are only an inch or so from the ends. To make our design work, we had to drill new holes. To do this (and probably void the warrantee in they process), we had to remove the covers from the light fixtures, mark the locations, start each hole with awl and then drill them, being careful not to cut through the wiring. For each S-hook, we drilled two holes, one for each end of the bottom loop. 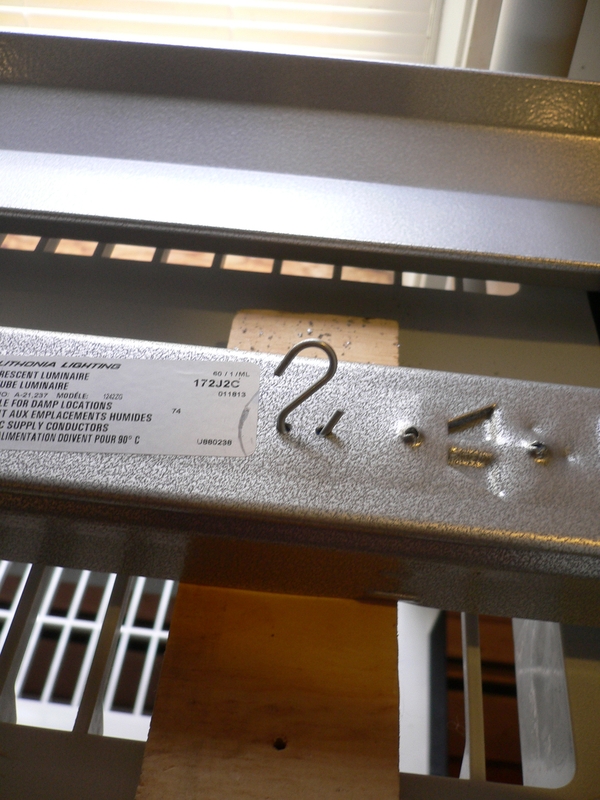 As for the shelves, we had to unbend the S-hooks to feed them into the holes but because these connections were not blind (we had access to both sides) we were able to rebend them to make them tight and secure. We hung the first light fixture using the lengths of chain provided and installed the two fluorescent bulbs. We then tested the light’s operation and adjustability to make sure our measurements and techniques were practical. Everything worked well and we quickly repeated the process for the remaining two light fixtures. Now we needed power. I have a big bin full of extension cords and it often seems that I have every conceivable variation except the one I need. But I got lucky this time and found a relatively short one with receptacles for three grounded (i.e., three-prong) plugs. We plugged the fixtures into the extension cord and then, using zip ties (how did I ever survive without them? ), fastened the cords to the shelves and posts. 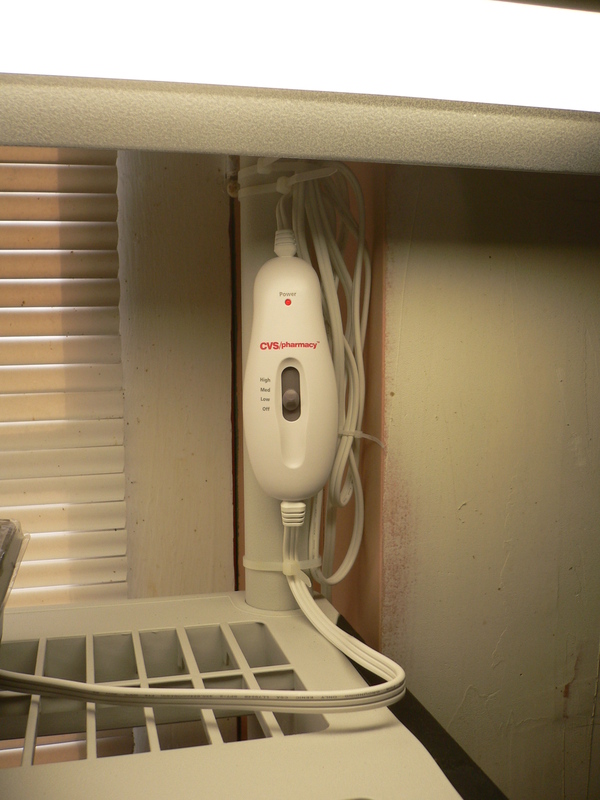 Finally, we plugged the extension cord into the conveniently-located outlet and switched the fixtures on. The rig is now ready for seeds. 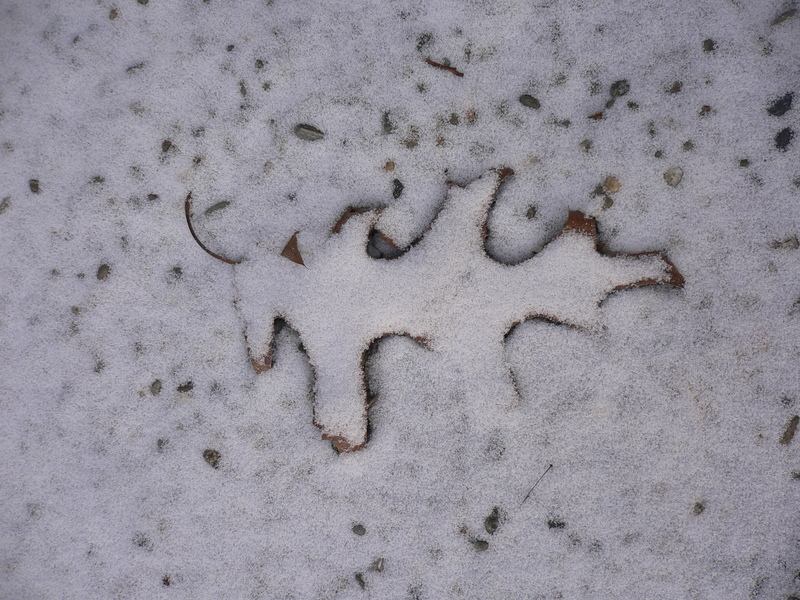 The sun will provide light and warmth during the day, hopefully enough to initiate germination of the seeds. 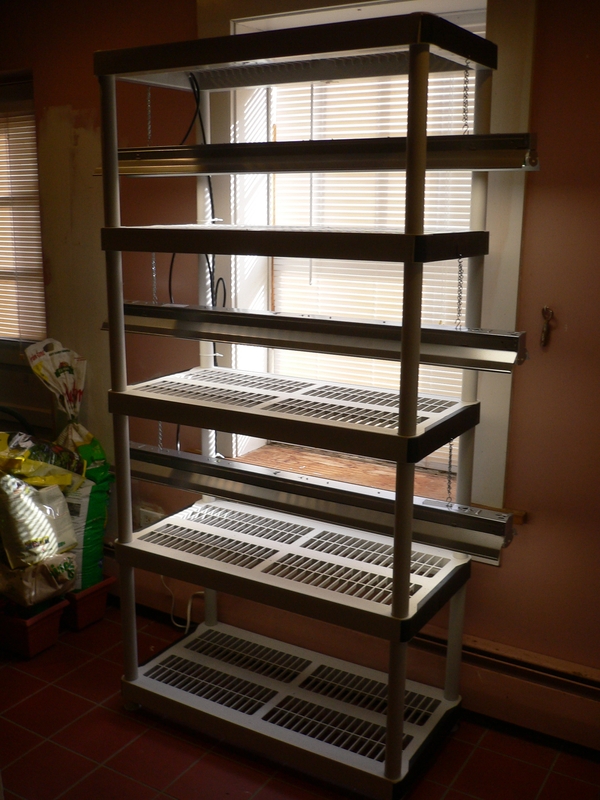 Once the seedlings emerge, the light fixtures will supplement the sun’s light and extend the length of the growing day (I did forget to get a timer with a grounded outlet so another trip to the Home Depot will be needed). Okay, so we’ve decided to start seeds indoors. It’s time to design a place to grow them. We could buy a fancy, specially-designed rack with built-in lighting and heat but that can be very expensive. Also, a pre-fabricated unit might not fit our needs exactly and would probably not be easy to modify. 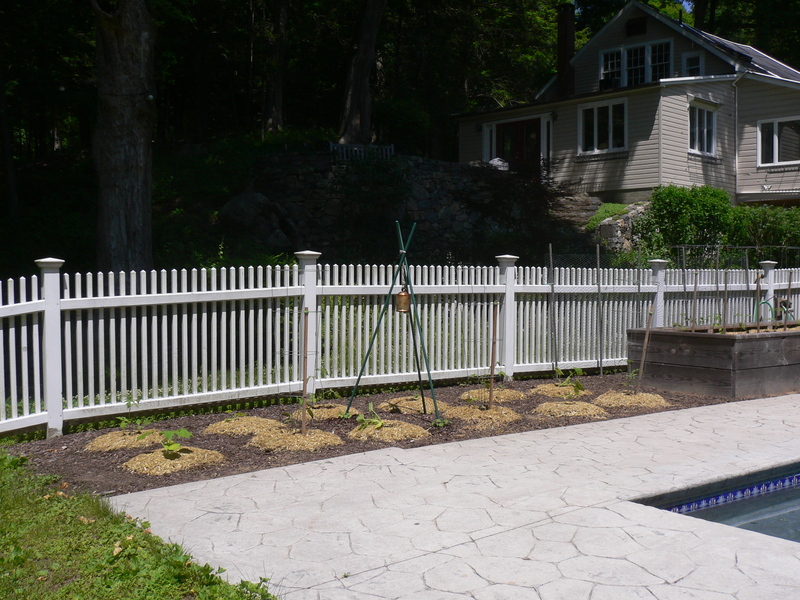 Furthermore, it wouldn’t fit in with our do-it-yourself mindset regarding the garden and its appurtenances. Instead, we’ll put one together from items we can buy at the Home Depot. Most of the rigs we’ve seen in catalogs are based on free-standing shelf units so that’s where we started. Because we do not have a lot of room in our basement, the unit will have to be of modest size and more vertical than horizontal. Also, because there will be water (probably everywhere), the shelves should not be metal (which could rust) or wood (which might rot or get moldy); plastic would be the ideal material. Browsing the Home Depot website, I found an 18” x 36”, 4-shelf unit for less than $20. It is made of plastic and is listed as heavy-duty which sounds ideal. 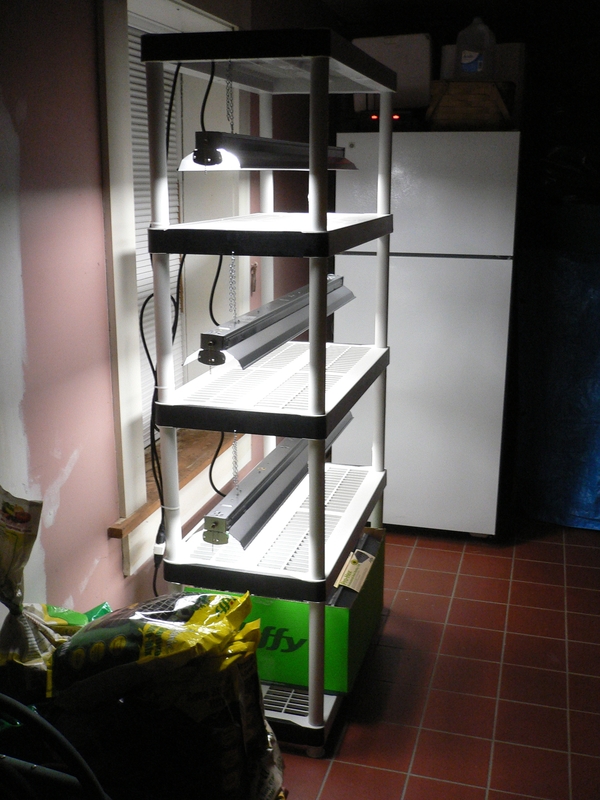 The next component of the seed growing apparatus is the lighting. My first impulse was to do a search for “grow lights” to see what came up. What I found was a bit shocking, pricewise. At the low end there were fluorescent fixtures starting at $25 dollars for a single two-foot bulb and at the other end were LED grow lights starting at almost $200, again for a single bulb. I need three 4-foot-long fixtures with at least two bulbs each making these alternatives much too expensive. 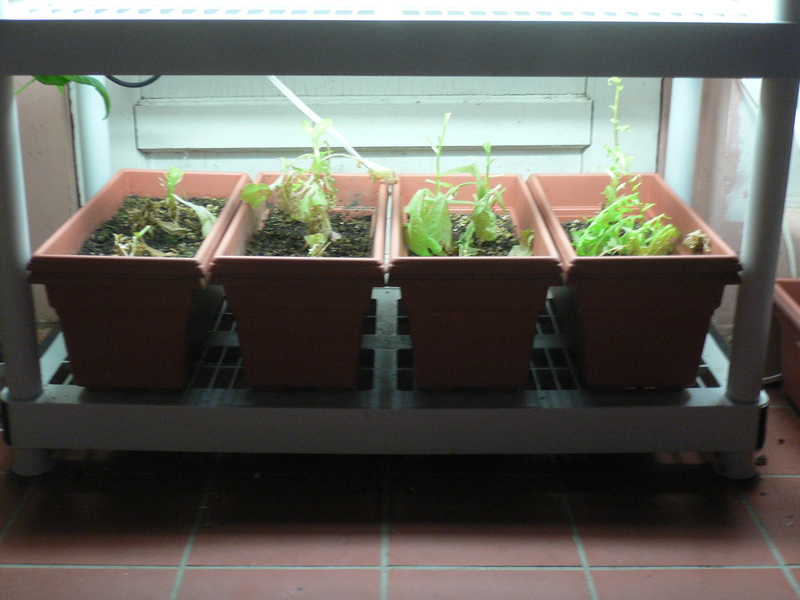 And from what I’ve read, ordinary fluorescent fixtures are just fine for bathing seeds and seedlings in cool, white light.Also, the fixtures do not need to be beautiful (even if they needn’t be ugly, either) so ornamental or otherwise decorative models are out. Basic, utilitarian shop fixtures seem like a good choice and, sure enough, I was able to find a 4-foot, two-bulb unit for around $20. 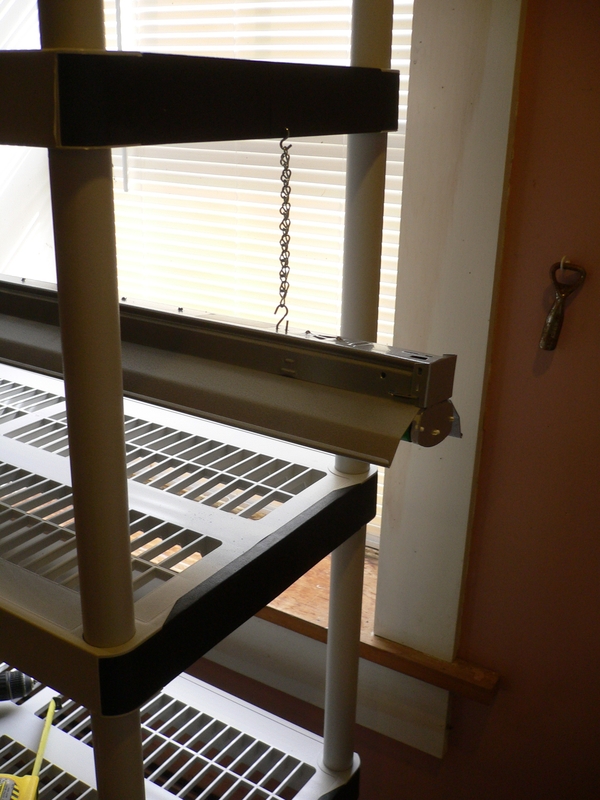 This fixture is supported from two chains—spaced, fortuitously, at about three feet apart—which will allow us to adjust its height above the seedlings as they grow. We’ll get three and at least six 32-watt T8 cool white bulbs (like batteries, they are seldom included). We next turned our attention to the trays in which we will plant the seeds. Again, there are a lot of designs available, many of them customized for the purpose. 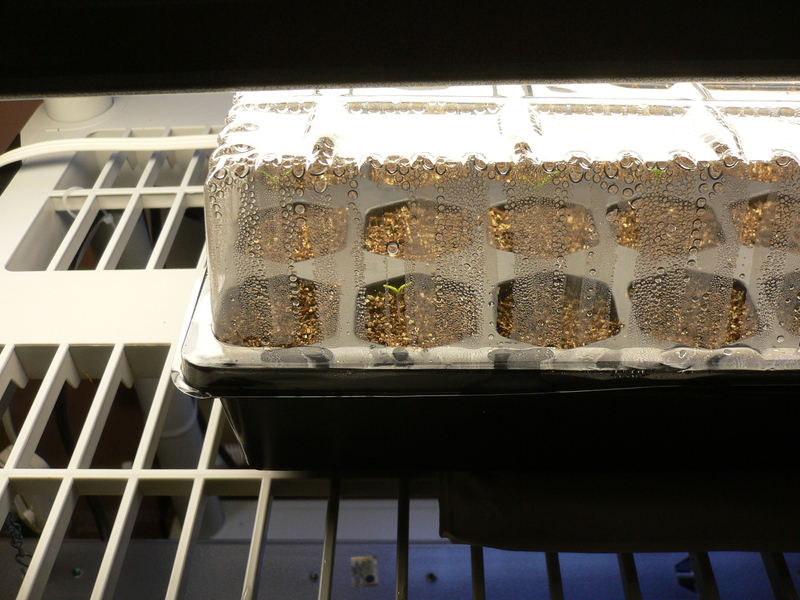 For instance, some of the trays are compartmentalized to make transplanting easier. The compartments come in different sizes as well with the smaller ones being better for sowing seeds. 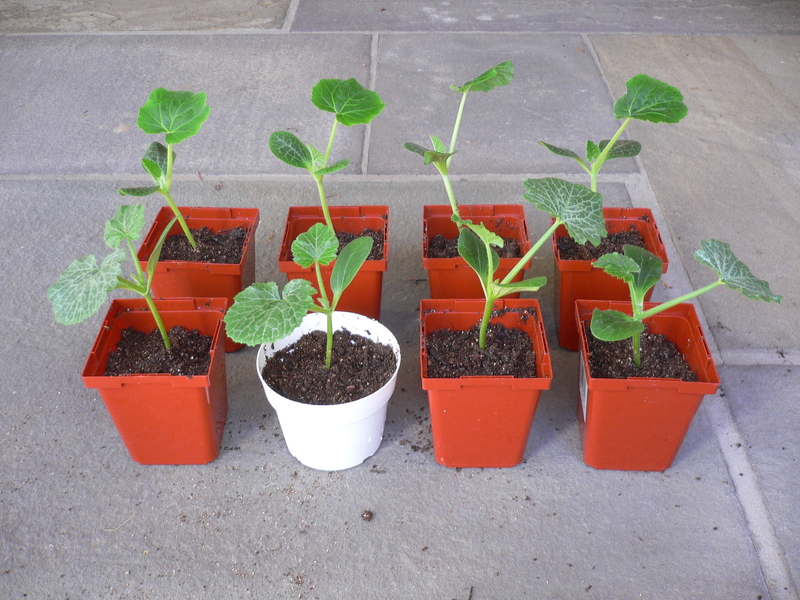 The larger cells may be needed for potting up those seedlings that are not ready to go into the ground. The compartmentalized trays seem like a good idea but I think they might be harder to fill with soil. Instead, we will plan on simple, non-compartmentalized trays. My search came up with a lightweight plastic model that is 11 inches by 22 inches in area and 2.5 inches in depth. We can fit two per shelf and even though they will extend beyond the ends of the shelves, they will still be completely covered by the light fixtures. We will need six trays. If we need to pot up, we will look at possible alternatives at that time. 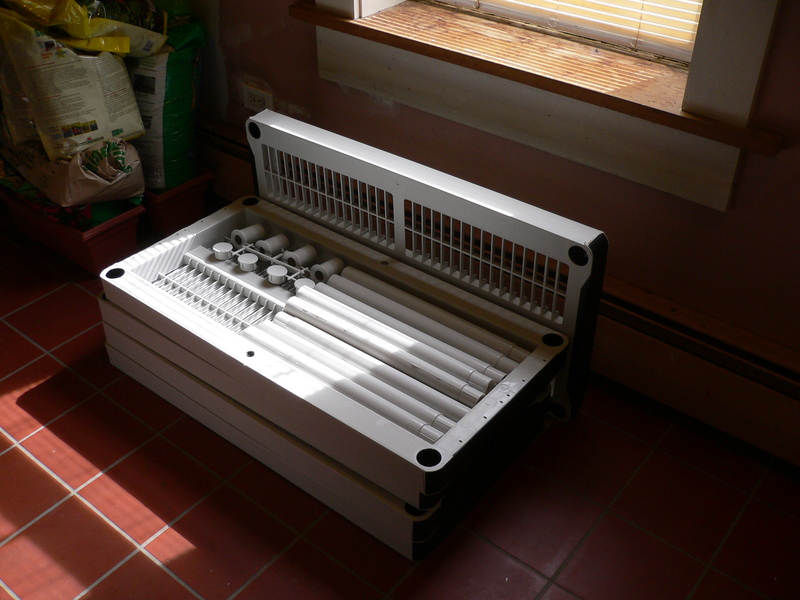 At least two companies sell trays with each compartment filled with a pellet of compressed seed starting mix; when moistened, the pellet expands to fill the compartment. This is another good idea but it is much more expensive. And eventually, we will need loose soil (for potting up) so why not start with it? 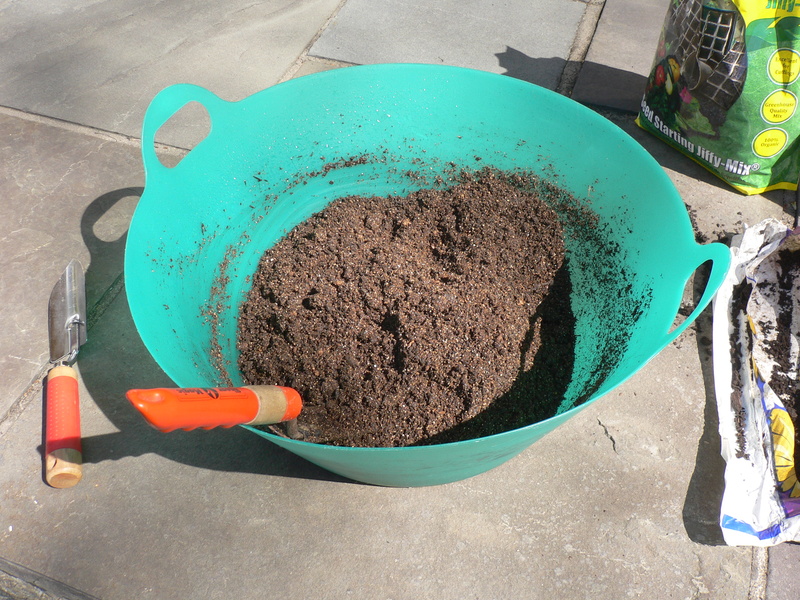 Our gardening books tell us that all we need is a balanced mixture of milled peat moss and fine vermiculite so we will buy some of each and mix it ourselves. Or perhaps we’ll get lazy and buy something pre-mixed. 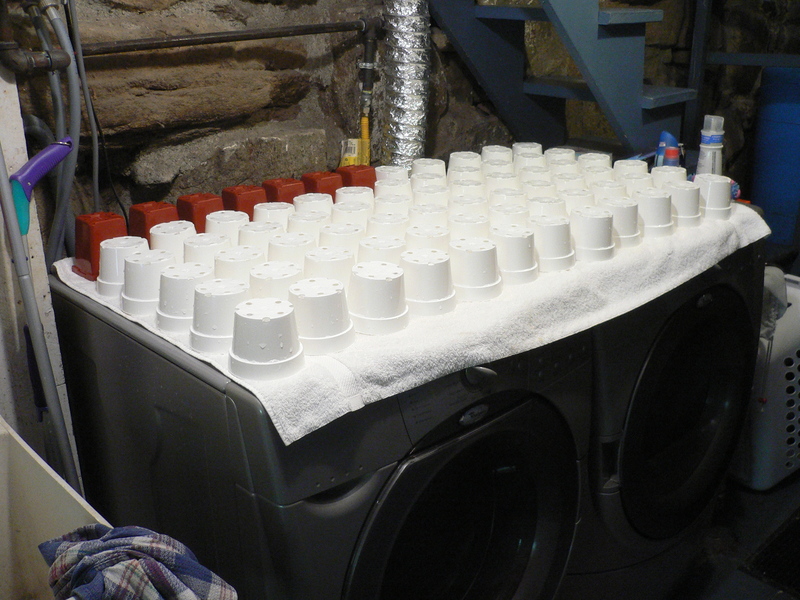 Some seed starting rigs include heating pads to keep the soil and seeds at the optimum temperature. We could get one sized to fit our trays (8.5 inches by 20.5 inches); however, at $20 each, the cost for six ($120) would exceed the total cost of all of the other items combined. To avoid this, we’ll locate the seedling rack in the warmest part of the basement, near the oil burner. The thermostat is usually set at 55 degrees down there but adjacent to the furnace, it is easily 10 degrees warmer. 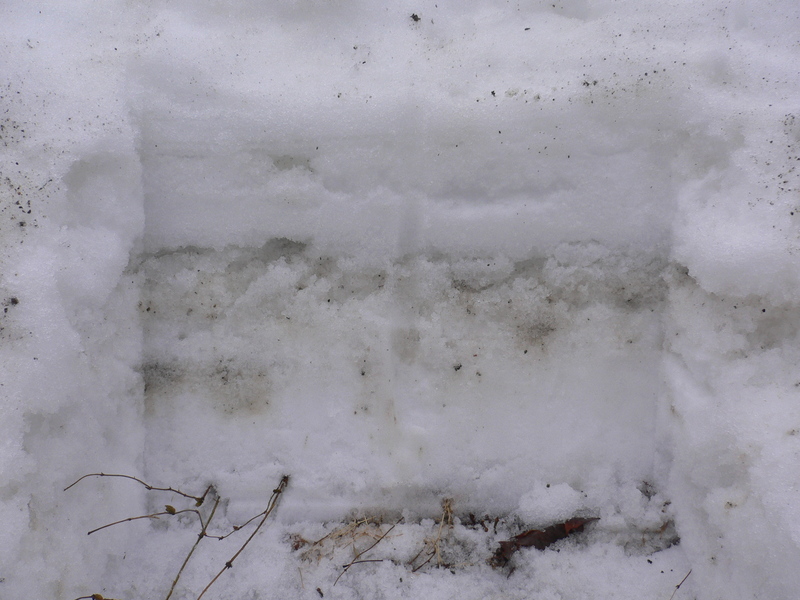 To help the soil retain its heat, we will get clear plastic bags in which to ensconce the trays. 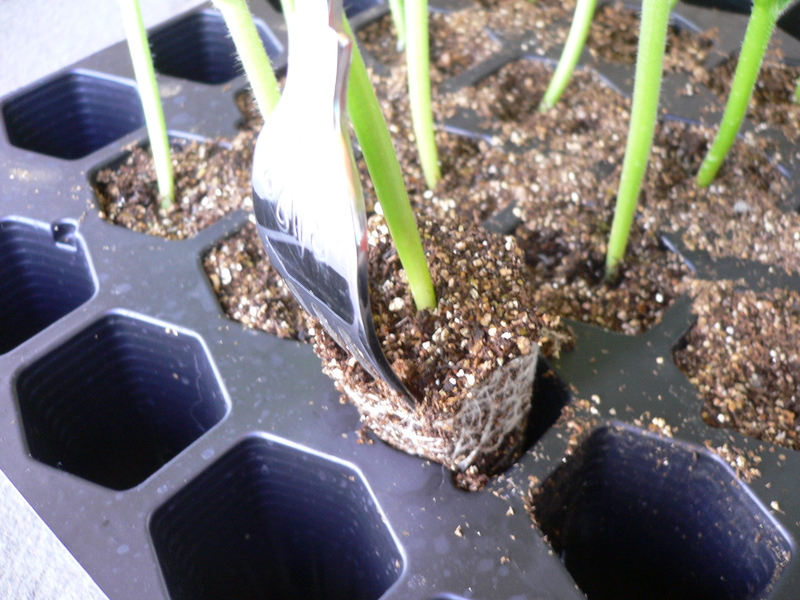 The plastic will allow the light (and its warming radiation) to reach the soil surface while keeping in the heat (and moisture, for that matter). To ensure that we are maintaining an appropriate temperature, we will also get a simple soil thermometer. 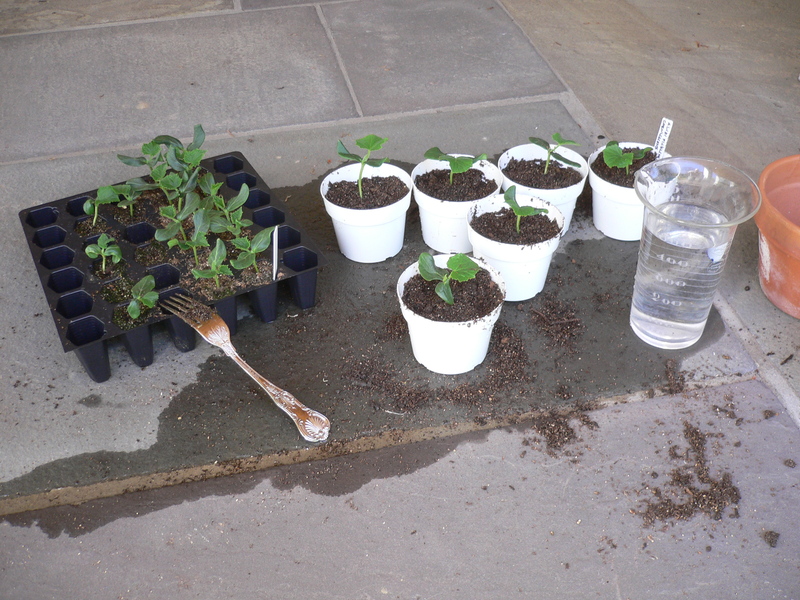 Speaking of moisture, we will get a spray bottle to gently water the soil and the seedlings when they emerge. With potentially hundreds of seedlings—most of which will look nearly identical to each other—we will need to identify what we planted and where. As a final component of our seed starting apparatus, we will buy row markers to keep everything straight. Ideally, these will be something simple and cheap (e.g., popsicle sticks) and, preferably, re-useable (therefore, probably made of plastic).